It’s no secret that we love playing with food around here! The only thing that’s more fun than playing with food is actually eating it…and this acai bowl is no exception. 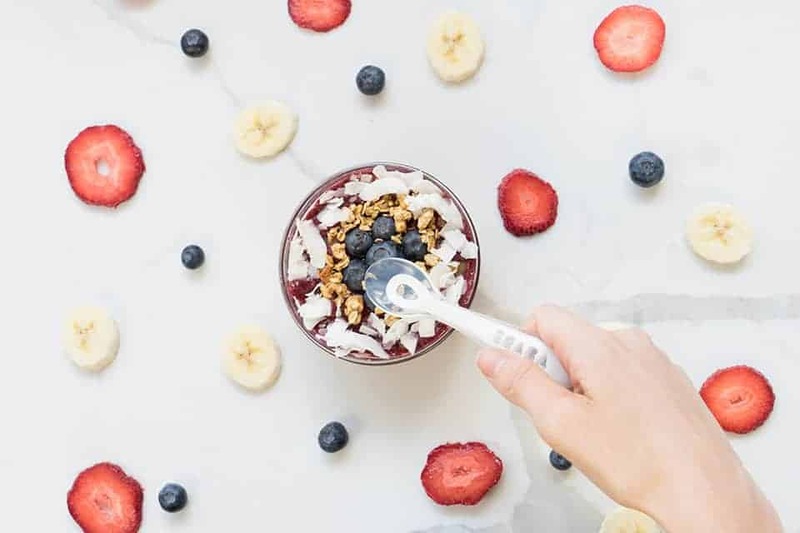 It’s called “Baby’s Acai Bowl”, but make no mistake – this recipe can be enjoyed by toddlers, older kids, and adults too! Everybody in your family can customize their bowl and then show off their berry delicious creations. It's no secret that we love playing with food around here! The only thing that's more fun than playing with food is actually eating it...and this acai bowl is no exception. It's called "Baby's Acai Bowl", but make no mistake - this recipe can be enjoyed by toddlers, older kids, and adults too! Everybody in your family can customize their bowl and then show off their berry delicious creations. Put the fruit and 1/2 a cup of milk in the blending bowl. Pulse to blend, gradually adding more milk until fruits combine and are smooth. Pour into a bowl, add desired toppings and dig in! Will I Ever Stop Peeing Just A Little? How Can I Find My Parenting Zen?